President Grover Cleveland: Short biography of President Grover Cleveland and the key events during his presidency. Grover Cleveland (1837-1908), nicknamed "Uncle Jumbo", was the 22nd and 24th American President and served in office from 1885-1889 & from 1893-1897. The Presidency of Grover Cleveland spanned the period in United States history that encompasses the events of the Maturation Era or the Gilded Age. President Grover Cleveland represented the Democratic political party which influenced the domestic and foreign policies of his presidencies. The major accomplishments and the famous, main events that occurred during the time that Grover Cleveland was president included the Presidential Succession Act, the dedication of Statue of Liberty (1886), the Interstate Commerce Act (1887), the Dawes Severalty Act (1887), the Panic of 1893, Chicago World's Fair (1893), the invention of the Ferris Wheel, the Haymarket riot and the Pullman's Strike (1894). His presidency also witnessed the Klondike Gold Rush, the Charleston Earthquake and the end of the Wild West. Following his first term in office the next president was Benjamin Harrison. After his second term in office he was followed by William McKinley. Grover Cleveland died on June 24, 1908 of a stoke, aged 71. The nickname of President Grover Cleveland provides an insight into how the man was viewed by the American public during his presidency. The meaning of the Grover Cleveland nickname "Uncle Jumbo" refers to his large size in a reference to Jumbo the elephant who had toured with P. T. Barnum's circus just before Cleveland became president. The character traits of President Grover Cleveland can be described as outgoing, friendly, affable, charming, elegant, emotional and compassionate. It has been speculated that the Myers-Briggs personality type for Grover Cleveland is an ESTJ (Extraversion, Sensing, Thinking, Judgment). An outgoing, practical, realistic and civic-minded character with a strong belief in rules and procedures, placing a high value on competence and efficiency. 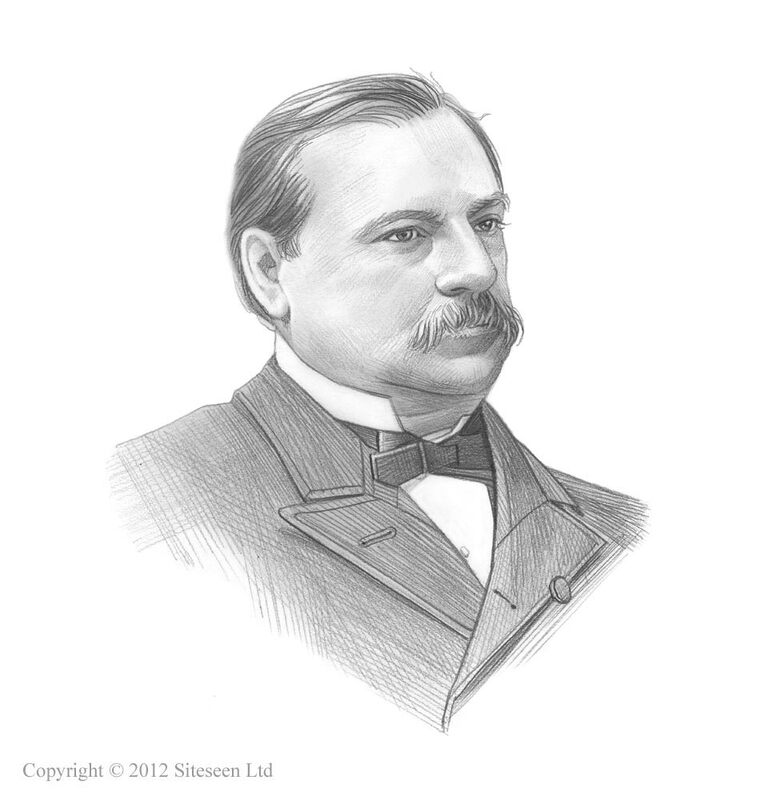 Grover Cleveland Personality type: Decisive, hardworking, methodical and orderly. The accomplishments of Grover Cleveland and the most famous events during his presidency are provided in an interesting, short summary format detailed below. Summary of the Haymarket Riot: The Haymarket Riot occured on May 4,1886 and was a violent confrontation between Chicago police and protesting workers that resulted in a bomb being thrown by an anarchist at a squad of police officers who were attempting to disperse the labor rally . Summary of the Charleston Earthquake: The 1886 Charleston Earthquake occurred on August 31, 1886 and reached between 6.6 and 7.3 on the Richter scale. The Charleston Earthquake resulted in the deaths of 100 people who were crushed to death or burnt in the numerous fires that broke out. More than 2000 buildings were damaged or destroyed leaving over 25,000 people homeless. Summary of the Dawes Severalty Act: The Dawes Severalty Act, aka the General Allotment Act, was passed by Grover Cleveland on February, 8, 1887 to protect the property rights of Native American Indians. However the provisions of the Dawes Severalty Act were organized in such a way that Native American tribe members would be assimilated and integrated into American society and culture. Summary of the Interstate Commerce Act: The Granger Movement, a coalition of U.S. farmers, was founded in 1867 by Oliver Kelley to promote the social needs of farmers by reducing isolation, addressing economic issues and advancing new methods of agriculture. The Granger Movement gained considerable political power and backed the 1887 Interstate Commerce Act which was passed on February 4, 1887 curb the monopolies of railroad companies and address the cost of freight-shipping on the railroads. Summary of the Statue of Liberty: The 300ft Statue of Liberty was dedicated on October 28, 1886 attended by President Grover Cleveland, as a symbol of friendship between France and the United States. The sculptor and designer was Frederick Auguste Bartholdi who hired Alexandre-Gustave Eiffel as the initial internal designer of the structure. The first presidency of Grover Cleveland ended on March 4, 1889. The next president was Benjamin Harrison. Summary of the Panic of 1893: The second term in office for Grover Cleveland began with the Panic of 1893 which led to a four year economic depression with 20% unemployment and resulted in civil unrest, demonstrations and strikes. Summary of Chicago World's Fair: The wonders of the World's Columbian Exposition aka Chicago World's Fair was held in Chicago to celebrate the 400th anniversary of the arrival of Christopher Columbus in the New World in 1492. Chicago World's Fair was opened on May 1, 1893 by President Grover Cleveland and provided exhibitions, music, entertainments and food for 27 million visitors over a period of six months until it closed on October 30, 1893 (Columbus Day). Summary of the Ferris Wheel Invention: The 264ft tall Ferris Wheel Invention was the greatest attraction at the Chicago World's Fair. Summary of the Pullman Strike: The Pullman Strike, led by Eugene V. Debs, began in Chicago on May 11, 1894 and led a widespread railroad strike across the nation due to the impact of the Panic of 1893. President Grover Cleveland authorized the use of US troops, who used harsh methods to suppress the strikers, and the Pullman strike was broken by July 17, 1894. Summary of the Atlanta Compromise: The Atlanta Compromise was was the name given to a speech made by Booker T. Washington at the Cotton States and International Exposition in Atlanta, Georgia on September 18, 1895. The speech reflected the progress since emancipation and about racial cooperation. Summary of the Plessy vs. Ferguson Case: The Plessy vs. Ferguson Case was an important legal case in which the Supreme Court ruled on on May 18, 1896 that "separate but equal" facilities satisfied the guarantees of 14th Amendment, thereby giving legal sanction to the Jim Crow segregation laws. Summary of the Klondike Gold Rush: The Klondike Gold Rush began on August 16, 1896 when George Carmack discovered Klondike gold in Rabbit (Bonanza) Creek, part of the Klondike River, a tributary of the Yukon River in Alaska. Summary of the Wild West: The end of the Wild West roughly coincided with the end of Grover Cleveland's second term in office. His second presidency ended on March 4, 1897. The next President was William McKinley.